Welcome to our monthly view through the garden gate. I realised this month that there is never a good time to leave a garden once the growing season gets under way. We usually go away in June or early July, so we were amazed on returning from our holiday down the Rhine, how everything had increased so much in size, in the short time we had been away! There had been sunshine and heavy rain, which had brought out all the slugs and snails. I think many must have choosen West Bay as a holiday destination - as last year we didn't need to use a deterrent against these blighters! I was saddened to see that the achocha seedlings that I had raised from the seeds Caro from An Urban Vegetable Patch had sent me had disappeared, and also the honesty seedlings from CT's seeds from Countryside Tales were covered in many holes. 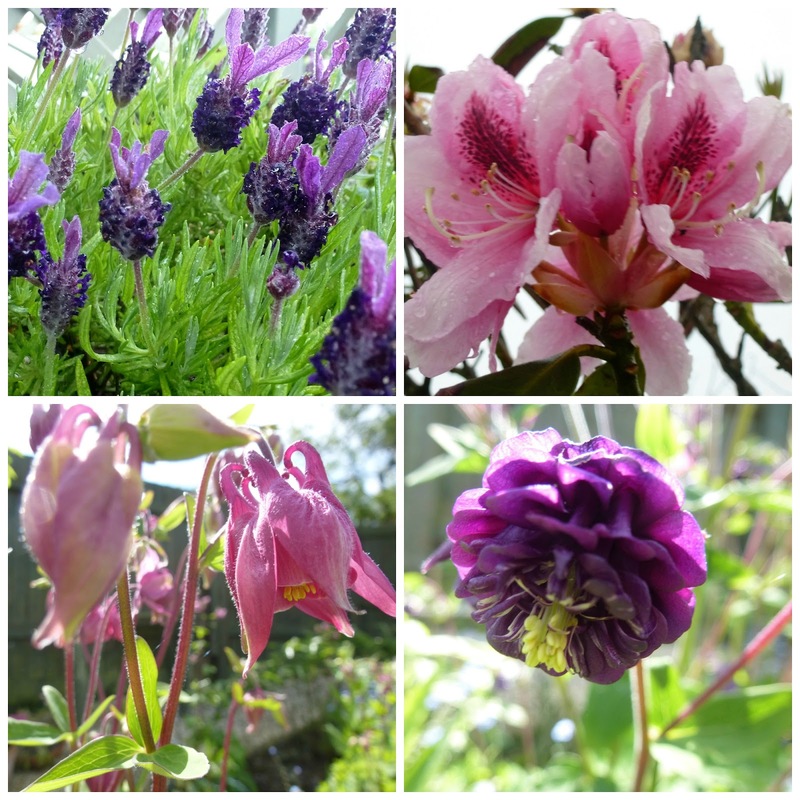 We were delighted to discover that there were many Granny's Bonnets (aquilegias) in flower. We brought the seeds with us from our previous home and it was wonderful to see them flower for the first time and to welcome the varieties we had previously loved. The scent and colour of the Matthiola perennial is lovely, We found this flowered for several months last year. 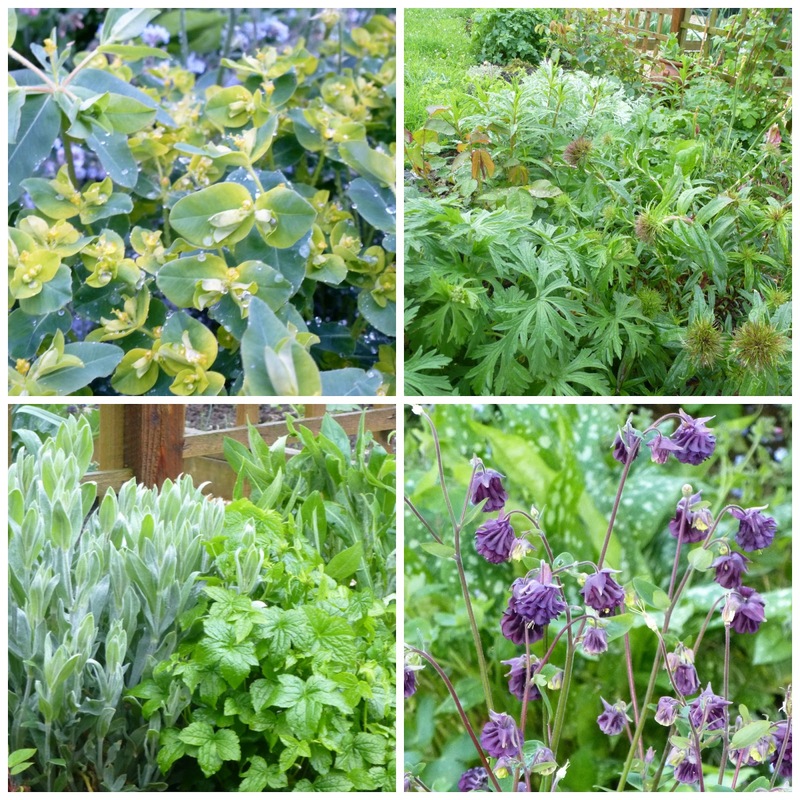 Fresh green growth is everywhere - the cuttings we bought with us and planted in November 2014 have obviously taken quite some time to settle but they are triple the size this year. produce florets. I expect it will go to seed very quickly, but it is good to eat especially after waiting for it for so long. In one of the vegetable beds we have a variety of different of salad leaves with a small crop of shallots and this year we are trying elephant garlic. Has anyone ever grown this? If any one else wants to join in please just let me know in the comments below, I have found already that it is a good way to keep track of the changes in my garden and notice the changes in the other gardens too. It has been lovely to have a warm bank holiday weekend. We seem to have spent most of it in the garden. I did manage to attend the Bridport Vintage market and meet up at long last with Vintage Jane. It is always good to meet up with someone you have made friends through blogging. She had some lovely things to buy including some fantastic vintage clothes and homemade cards. I hope you had a good weekend too, until next time. Your garden looks fantastic! We are very ahead here with almost no flowers in the garden as it has been already exhausted since april!Aquilegias add so much beauty in all! Never seem them here. May was a good month for the garden. Yes indeed, here the roses are flowering. Come with me through my garden gate. Dear, dear Sarah! Oh, you too? You too are enjoying the fruits of the earth? I can't remember a better spring than the one we are currently having, and the blooms are just magnificent. You always have something fabulous to see blossom into summer, and I love to come visit you. I hope you, Tavi and family are well! Enjoy every single minute of this glorious time. Such a beautiful garden! The best thing in my garden is perennial alyssum. We had a mild winter and all of it survived. It is huge and needs to be separated next spring. Have you seen the blog post by Rusty Duck with her anti-slug recipe..might be worth a try. Meanwhile, I have to admit I love your garden pics. Mixed results so far. It seems to have worked on irises and in the veg garden (miracle!) but some plants have still proved too irresistible even garlic flavoured.. agastache and rudbeckia to name but too. I've also found the concoction needs to be really fresh, you really need to be able to smell it (sadly) as it's applied. This casts some doubt on my idea of freezing it, but I will try some of my ice cubes anyway and see if they still work. Beautiful! There ist never the time to leave the garden! :) But I will do so soon. I have a very nice neighbour which is watering al pots and looking for the house. We had so much rain, the garden is dump and wet, the air is sticky and the midges makes me pain. Your garden always looks so good, it must take a lot of hard work to keep on top of it all! Lots of lilies are blooming right now in my garden. I love how the former owner planted so that different plants bloom in succession. Yours looks beautiful. Must be the sea calling it. We call our Aquilegia "Columbine". Most of my roses have been blooming for a couple weeks....one for the first time in the 2 years I've had it. Your Matthiola looks like our Garden Phlox. Mine have bloomed yet. Your garden looks lush and beautiful! Your garden looks beautiful Sarah! So lush and green. Hurray to daughters who take care of our garden when on holiday. Sorry to hear about the slugs.....do you have a good deterrent? I don't like using bait but am not sure what else has much chance of working. We had very few slugs last year but there seems to be loads this year - I wondered if it was because the garden is becoming more established, having started from scratch, and that there's now more of interest to eat! But perhaps it is just the weather this year. Your garden looks wonderful, I love granny bonnets but the naughty bunnies cut all their flowers off and leave them on the ground. Your garden's looking very lush and flowery. Granny bonnets are so pretty aren't they, and I like their feathery leaves too. I love the promiscuous little aquilegias especially when you never know quite where they will appear and what colours they will be. This year mine, like yours are very prolific, but my DiL has told me that in her area they have all developed a downy mildew specific to aquilegias and have died. I am really hoping that it does not travel to this side of the country, I have enough of a problem with Box blight. Your garden looks so gorgeous with all your beautiful plants flowering. love the lavender and all your pretty flowers and vegetables. Great that your daughter was able to care for Tavi, Twinkle and the garden while you were away. As for slugs, they a pain and shame when your seedlings disappear, honesty is such a lovely plant and must get some seeds to grow some. How nice that your daughter can garden (and pet) sit for you. But I don't envy you those fat slugs. Your garden looks lush and fragrant! Happy June. Your daughter is an excellent garden-sitter, Sarah, everything looks beautiful (well, maybe not the slugs). Hi Sarah, I'm a bit late with my blog this time. Your garden is looking lovely. I love aquilegias too and mine are all over the place. A lovely look at your garden-I'd really like to do the same as I'm making changes and seeing the garden develop. I want to visit Bridport again to go to the antiques centre. Hello Sarah - it was lovely to catch up with you at last at Bridport. It turned out to be a good day in the end!